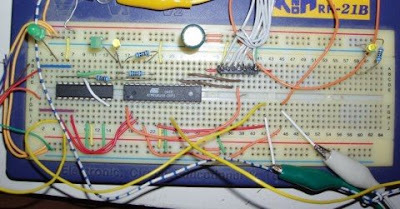 This decoder is fed by a RDS demodulator IC (or tuner) which has RDDA (data signal) and RDCL (clock signal) outputs.The microcontrolller is an Atmega168 clocked on the external 4.332MHz crystal from the RDS demodulator. TDA7330B RDS demodulator IC from STMicroelectronics to be used in this project. The TDA7330B is connected to the Atmega168 with RDDA connected to PD4 (on PORTD) and RDCL to INT0 (PD2).